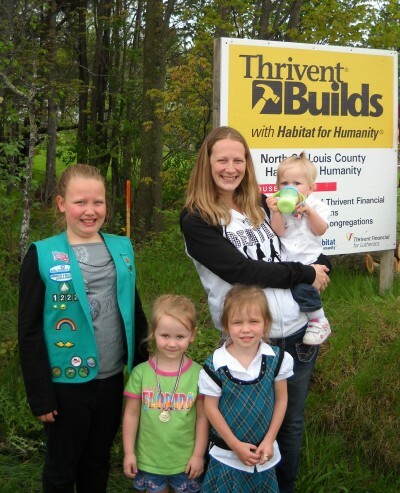 The Chinn's home was being built in partnership with Thrivent Financial for Lutherans who supplied 55% of the funds for the projects along with commitment from local Lutheran congregations for an additional 10% of the funds needed. Local Lutherans and Thrivent members committed to providing 50% of the volunteer labor. The Catholic Daughters of the Americas also sponsored the home with a $10,000 grant and volunteer labor from the local Catholic Community as well as members of the Catholic Daughters’ from across the state. 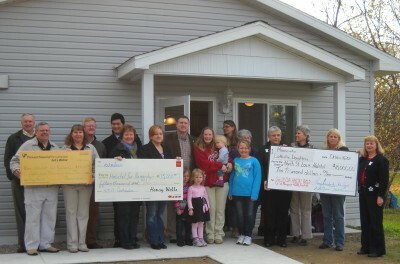 The Wells Fargo Foundation sponsored the home with a $15,000 grant and volunteers from our local Wells Fargo Bank. The City of Eveleth also donated the lot that this home was built on. What an amazing example of community cooperation to meet a great need. This is truly a home that was being built for a family in need by a caring community! Many partners can and are getting together to make an impact on North St. Louis County's housing need one family at a time. There is still room for many more partners! What will you build? When I was filling out the application for the Habitat house, I never imagined it would become a reality. I received the first phone call to set up an interview at our apartment with my children; I couldn’t believe we were being considered for a house and I was afraid to say anything to anyone for fear of jinxing it. It seemed like forever until I heard back, but I got the call saying we were going to be a partner family! I couldn’t believe it, we were all so excited. The building process was confusion to all the girls…not really understanding what was really happening. Morgan was old enough to understand, [and] was all about wanting to help. She loved when [our] family brought food to the volunteers because she got to peek at the work in progress. As the rooms became more finished, she started picturing where things would go. She brought me to her room and told me where everything would go. Makayla loves to show people where her bunk bed is going and that she gets the top bunk. While we were packing things at our apartment, she kept asking if she could take different things to the new house. After a while I realized she thought we weren’t taking anything from the apartment. She know understands and it happy to hear we are talking all of our things to the new house. Mariska hasn’t said much, she likes to walk around [the house] and giggle. She is so excited that her eyes light up every time we walk through the door. When we are checking out at the grocery store, she talks to everyone telling them we are getting a new house soon. Meredith loves to run up and down the hallway laughing and always end up in the bathroom wanting to get into the tub. The home building process has been an emotional rollercoaster…We appreciate having this opportunity, working with so many wonderful people. It has been so unbelievable to me how so many people from the community came together to help us make our dream a reality.